Flights are returning to normal after an air traffic control computer failure saw planes grounded across the UK. The West Drayton control centre is now fully operational and National Air Traffic Services says it is investigating the cause of the problem. Nats' Flight Data Processing System failed at around 0600BST for an hour, after overnight testing of an upgrade. Thousands of passengers have been experiencing delays as airlines work to clear the backlog of flights. 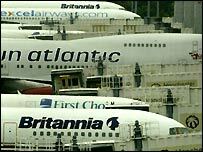 Planes had to be grounded at airports including Gatwick, Heathrow, Manchester and Inverness. By mid-afternoon, delays at Heathrow and Gatwick were still 90 minutes, while at Stansted and Scottish airports the delay was about 30 minutes. Nats Chief Executive Richard Everitt said flights were suspended so that controllers could prioritise on planes in the air, but that safety was unaffected. The system which handles the separation of aircraft in the air continued working during the system failure. Mr Everitt apologised to passengers and said Nats was working with airlines to minimise disruption. "We will now investigate why there was this problem - clearly it was not an anticipated problem - a lot of work will be done today to understand why we had problems with this testing," he said. "What we did here was to ensure safety levels were maintained, we did that by taking the traffic right down, handling the arrivals while we sorted this problem out. " Mr Everitt said Nats was planning on spending over a £1bn on upgrading its system over the next eight years. Tory leader Michael Howard described the air traffic problems as "yet another example of government incompetence". But Transport Secretary Alistair Darling pointed to "decades" of underinvestment in transport by successive governments and insisted Britain's system compared favourably with other countries. "We are putting the money in, it is making a difference. "If you look at the delays caused by air traffic control failure they have come down dramatically over the last few years," he said. Mr Darling added: "It is very, very unfortunate and extremely irritating if you happen to be flying today that during the course of testing for an upgrade and improvement to the West Drayton system something went wrong and as a result you have got this disruption." Disruption is lessening throughout the country's airports though BAA says delays of up to two hours can still be expected at Gatwick airport and of up to 90 minutes at Heathrow. In a statement it advised passengers to ring their airlines for information on their flights and to check-in on time as usual. Easyjet says it has cancelled 40 of its flights and British Airways cancelled 25 - 18 short-haul and one long-haul from Heathrow, and six flights from Gatwick. Former Chancellor Kenneth Clarke was one of hundreds delayed at Heathrow Airport. He said: "My experience of flying between London and Milan has never been very happy and I just resign myself to fate that I will have to spend half a day here before I can get off the ground." Gillian Gowar, from Derbyshire, was concerned the delays would cut into a four-day break in Rome. She criticised what she said was a lack of communication about the disruption. "It's typical, nobody wants to tell you anything whether it's a railway or an airport, it's the whole country." Passengers Monica and Gerald Godfrey - waiting to fly to Toronto - earlier told BBC News Online they would have a cup of tea and relax after checking in. "It depends on how long the delay is," Mrs Godfrey said, "we might get a little uptight." Mr Godfrey added: "But at the end of the day there's nothing we can do about it. " I've been delayed by 10 hours and have missed an important meeting as a result. How are we supposed to travel these days?? Air, road and rail infrastructure are all creaking at the seams - businesses will migrate to Europe as a result. Next time I travel, I think I'll do it by hot air balloon. I am living in Brussels, and my brother (whom I haven't seen in years) took his first ever international business trip to Edinburgh this week. We agreed to meet in London. I boarded the Eurostar, and a half hour into the trip he called to say he had disembarked from his plane before it even left Edinburgh, and wouldn't be meeting me. I am in the process of moving back home to the States, and every day is precious. I've just wasted this one, and am now checking my e-mail in a high street internet cafe. Thanks NATS. The system went down and it went down with the minimal of disruption. Incoming flights were given priority to stop planes from landing on planes taking off. What alternative was there other than to give incoming flights priority whilst they sort out the problem? You would think that there was only Heathrow and London airports that were affected by this morning's air traffic control delay. What about Edinburgh and other Scottish airports? Also think of the all the staff who get it in the front line because of this. I walked into Terminal 2 on my way to Germany at 6.00am just as the system went down. Luckily the airport was relatively quiet at that time but there was NO information on when (or even if) planes would go. Luckily we managed to get out only 90 minutes late. "The problems began when engineers shut down part of the system"